Rising from the murky depths of a secluded swamp to join our series is debuting contributor Michelle Kinnison. Okay, so that part about the swamp isn’t true. In fact, I believe Michelle actually lives in Montana, and I’m pretty sure they don’t have swamps or lagoons there. Then again, maybe they do. I know very little about Montana… or anything else. 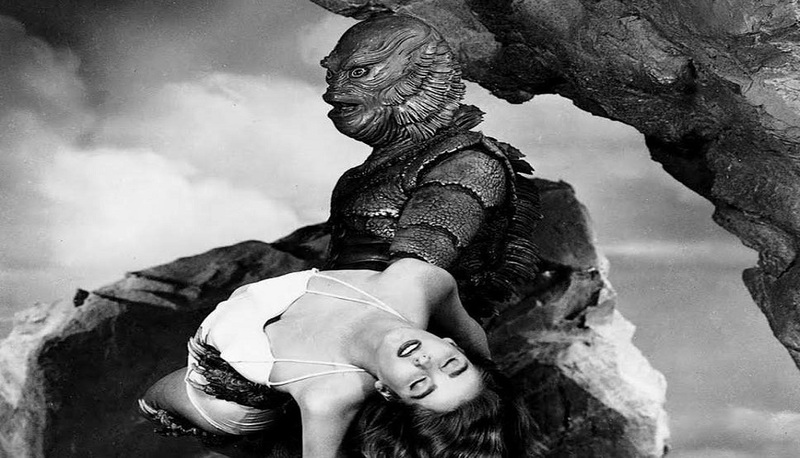 That, however, is not stopping her from taking us all to the murky depths for her look at 1954’s Universal Monster classic, The Creature from the Black Lagoon. For her entry, Michelle not only briefly reflects on the film’s rightful place in the pantheon of genuine horror classics, but also reflects on what the film means to her on a personal level, as well as her own response to the film’s legacy. There isn’t much that can be said about this film that already hasn’t. 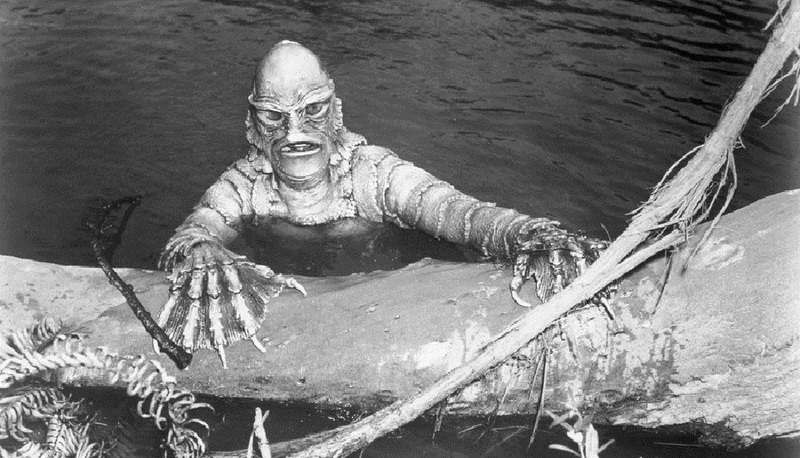 Yet, the one statement that is for certain, and what can’t be said enough, is: Creature from the Black Lagoon is a classic among many, and not just because its release was such a long time ago. It’s because of the effect the film had on the industry of Hollywood, as well as the audience. This is my beginning. The beginning into this genre which I have grown to love and share with my husband and family. This is one of the first horror/sci-fi movies I watched when I was little, and I fell in love with it. There’s such an intrigue, mystery and simplicity to the film that drew me in and captured my imagination (and still does), and later ignited an interest to discover things, to seek out something new which may have never been discovered before. This was my go to movie when at home sick or needing an adventure, this along with others of 1954, like Godzilla, Them!, and the classic 20,000 Leagues Under the Sea, to name a few. However, this Creature From the Black Lagoon was the one that stood out the most. The year was 1954, and in the time before it’s release, there hadn’t been anything quite like it. Not yet. Before February 12th of that year, there had been an array of horror movies that fascinated—as I am sure you will be reading about some of them during this Horror and Sons event, but it wasn’t until Creature from the Black Lagoon that audiences would be shocked and horrified around the world. From the very moment the film starts, we are introduced to a world not yet formed and the evolution of species. We are shown just how that evolution can have its changes on either perfection, or be that as it may, imperfections, but it was the imperfections of this creature that would change the way we view monsters, especially after this particular film. Without Creature, you wouldn’t have films such as Alien or even Predator; nothing with an elaborate monster tied to the movie. Being a one of a kind “Monster Movie” at its time of release, and in order to keep up with television and other upcoming films, it had been released in 3D! A spectacular event, especially for its time, and trying to keep the 3D film fad going, which is why the sequels were also released into this format in hopes of reviving the format itself. I could go on and on about the fascinating knowledge that surrounds this movie, most of which you all will more than likely know. Within the story, here are these people who basically show up and, in the creature’s eyes, begin to mess about and take it upon themselves to begin excavation in the lagoon that “It” has come to call his home. He first begins to wreak havoc upon the less fortunate who are made to stay behind and safeguard the camp site, while Carl Maia, the scientist who discovers the fossilized hand of possibly one of the first creatures, leaves the site and is now in search for further assistance and funding. It is in this moment when he leaves that the ones who stayed behind are attacked and eventually killed. Now, to most, they would view this scene as monstrous and, from the very beginning, can’t wait to see this creature die for its menacing act towards other human beings. But throughout the film, one may question, “Who is the actual monster here?” I can tell you honestly, from the beginning to the end, I am captivated and ultimately in love with this creature. If you really think about it, it’s viewed no different than if it were actually labeled as a love story. In the end, all it wanted was the girl. Just as anyone would want, it’s just someone to love. Look at King Kong; it can also be used as the same principle. Ultimately, out of all of classics, and joining the ranks for the Universal Monster realm, this has and always will be my favorite. The story, the fascinating creature effects, the “Gill-Man” himself, and even the cinematography play a huge part in my love for this film. For anyone who has seen this classic you will understand. And for those who haven’t, I hope that someday you’ll add this film to your collective knowledge of classic horror. Yay! Thanks for this chance, it was great to write this. Not sure on the swamps here in MT either, don’t know much about this state and I live here. Ha! Hope everyone who reads this enjoys.